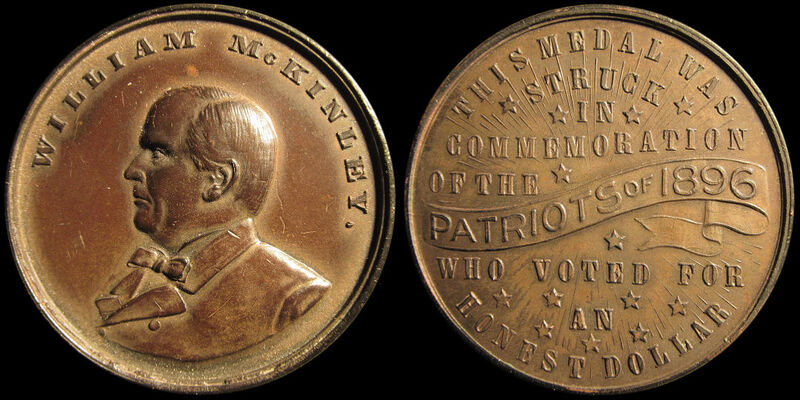 386) A political medal commemorating those who voted for McKinley and the gold standard, as opposed to Bryan and the bi-metallic gold/silver standard. I have included this piece because of it's unmistakable association with the Bryan dollars(HK777 - HK786), and also because it appears to have been minted as a commemorative "AFTER" the vote. 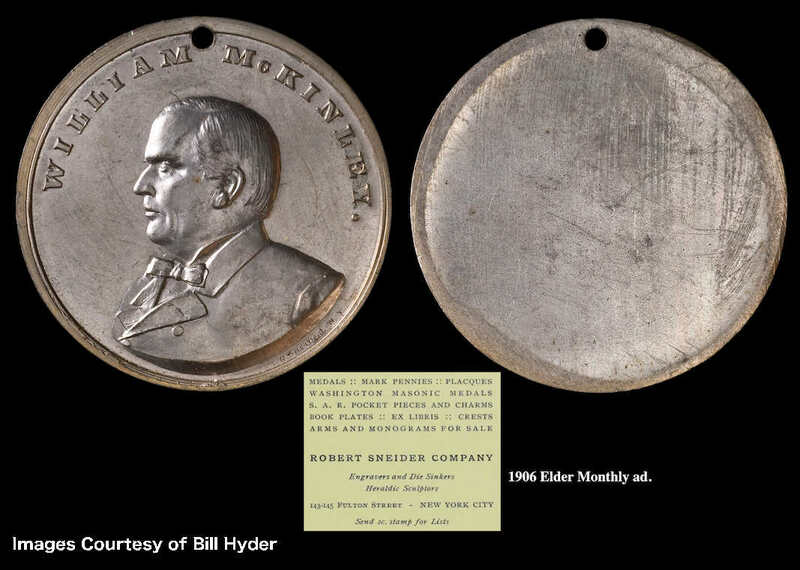 Minted by Robert Sneider of New York who was the successor to George Lovett. Found in white metal and bronze and probably of equal rarity in each metal. Combining both metal varieties together, Rare bordering on Very Rare. Bronze, 38.5mm. 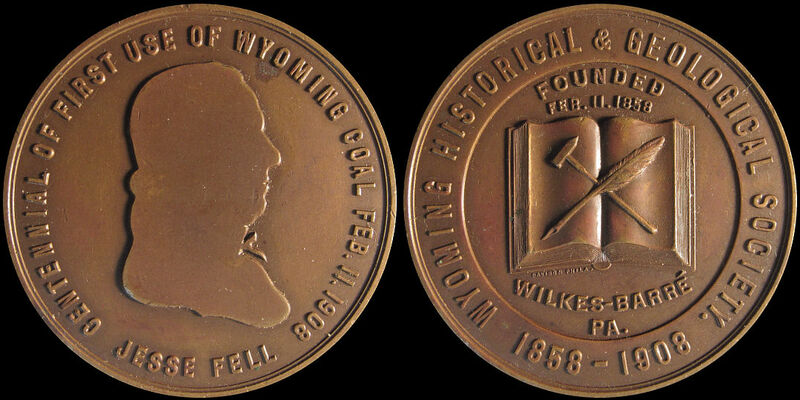 Click Here for a holed uniface version of this medal. 387) Unlisted in HK's first edition, HK866b in the second edition. A muling of the obverse of HK863 with the reverse of HK435. Dickeson 2 (Delorey). 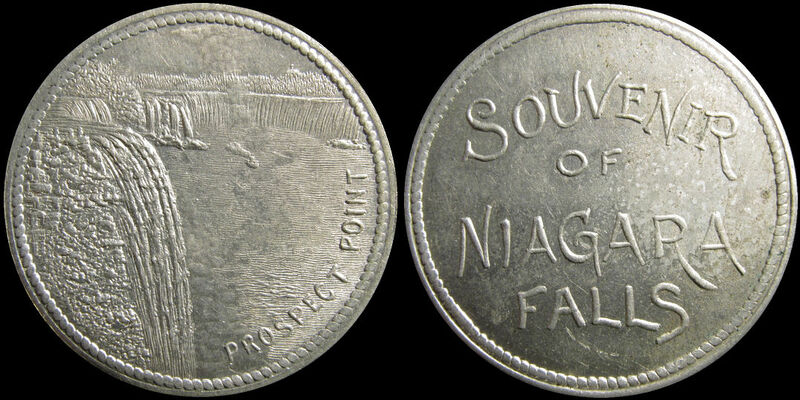 The "Confederation" side of this piece is also the same as the obverse HK442, the reverse of HK857, the obverse of HK866, the reverse of HK877, and the reverse of HK887. Rare. Copper/Bronze, 38.5mm. 387a) Like HK824 but with an incuse "1929". Evidently only three in existence. At this time the significance of the "1929" is not known. 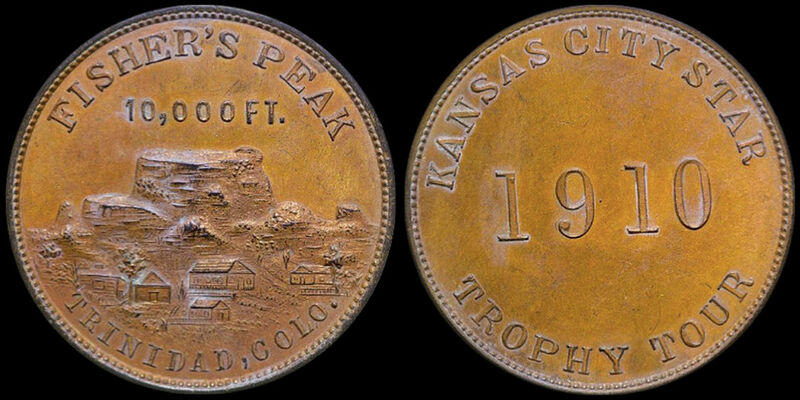 This example has a poorly struck "Denver" at a slight left to right upward slant relative to the upper line. 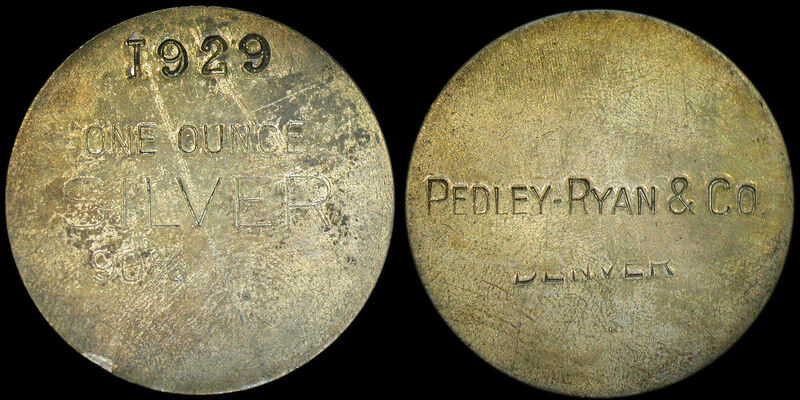 Pedley-Ryan dollars were hand struck. 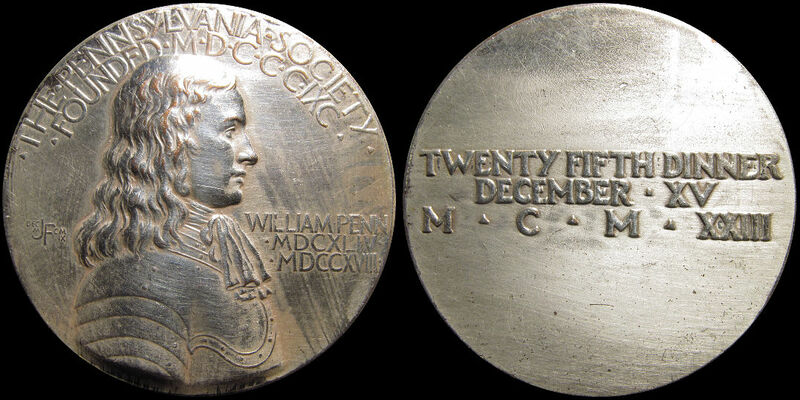 Daniel Carr (Moonlight Mint - Loveland, Colorado) has suggested that in the case of this piece, the die appears to have been struck twice - once tilted one way causing only the "Pedley-Ryan & Co." to be impressed into the disc, then slanted the other way and struck a second time causing only the "Denver" portion of the die to be impressed. Note that the upper part of the lettering in "Pedley-Ryan & Co" is stronger than the lower part of the lettering, with the opposite being true of the "Denver" lettering. He has also suggested that this might be the same reason that the "Denver" in HK826 is missing, as all of the HK826 pieces that he has seen are more deeply impressed in the upper parts of the "Pedley-Ryan & Co" lettering than the lower parts. A second example of this piece that I have seen has "Denver" in proper alignment and fully struck, so in that case the die was properly aligned and probably struck once. Extremely Rare. Image courtesy of Daniel Carr. 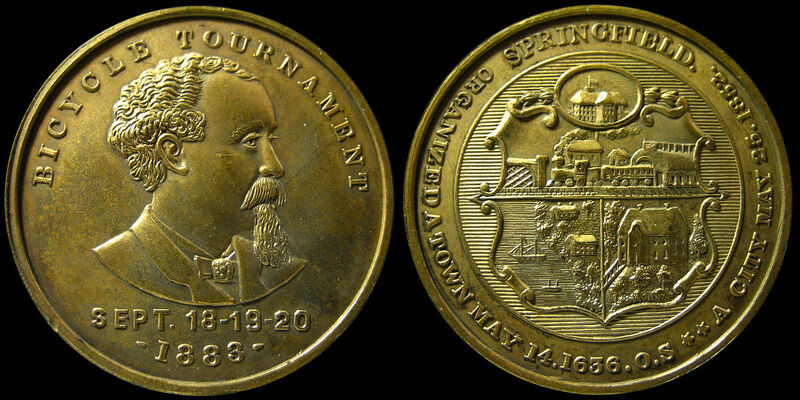 389) Commemorates a "Bicycle Tournament" and the City of Springfield. Very Scarce in white metal with approximately 2/3 being holed. Extremely Rare in gilt or bronze. Rulau Ma-Sp 2, Storer 1638. Gilt, 35.4mm. 390) Rowing regattas along the Schuylkill River in Philadelphia have been an ongoing tradition for over 150 years. 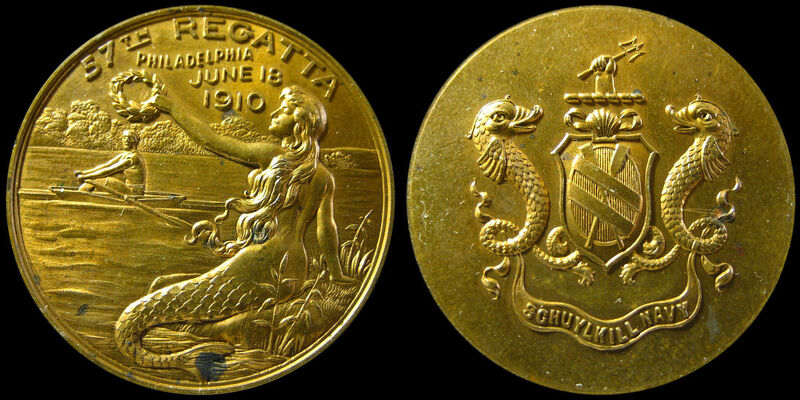 "57th Regatta Philadelphia June 18 1910", "Schuylkill Navy". This is the only one of these I have come across. Extremely Rare. Gilt, 33.5mm. 390a) Commemorating an automobile tour organized by the Automobile Club of Kansas City in 1910. It was to cover 2,000 miles in twelve days. Bronze, but have also found it described as brass. Very Rare. 38mm. Image courtesy of Robert Jesinger. 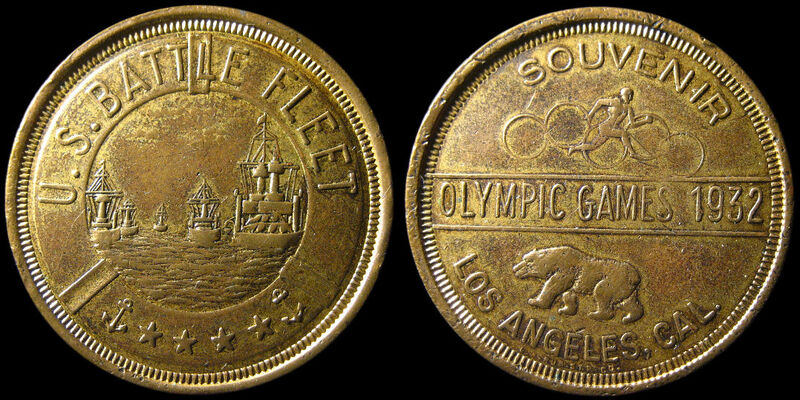 391) "Souvenir" of the "Olympic Games 1932" in "Los Angeles, Cal." 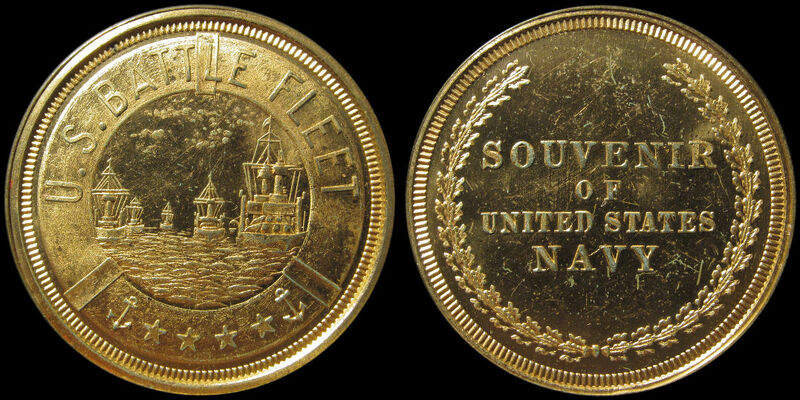 On the obverse: "U.S. Battle Fleet". Struck by Los Angeles Rubber Stamp Company(Johnson & Jensen #8 lot#689). This piece can be found either round or octagonal. Combining both varieties together, Rare. See #392 below. Gilt Brass, 38.1mm. 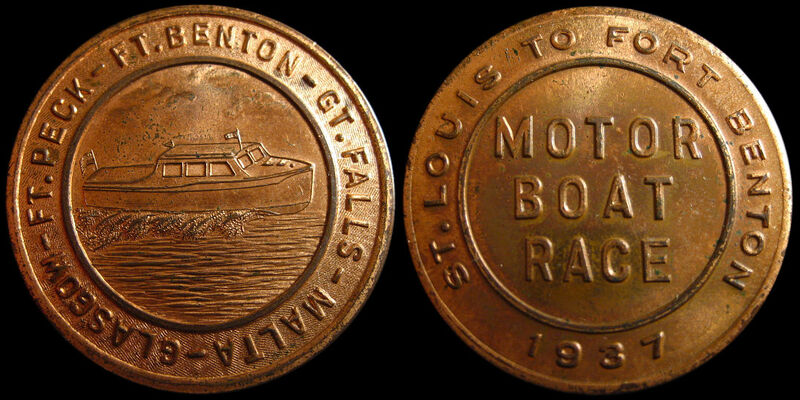 393) Souvenir commemorating a 1937 boat race from St. Louis, Missouri to Fort Benton, Montana. Rare. Copper, 37.5mm. 394) This athletic competition festival is still held today in Santa Barbara. 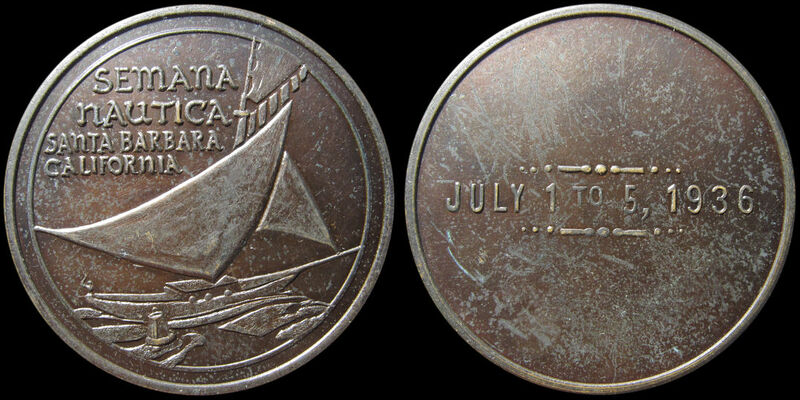 "Semana Nautica Santa Barbara California / July 1 To 5, 1936". Rare bordering on Very rare. Copper(?) plated nickel, 38.2mm. 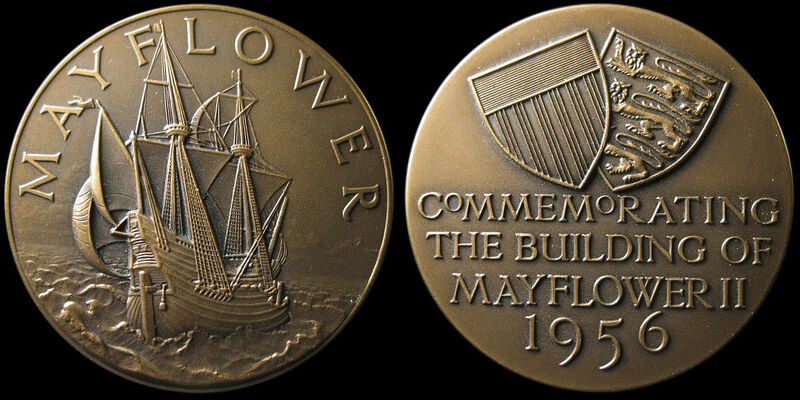 396) In 1957 the Mayflower 2 (a full scale reproduction of the original) sailed across the Atlantic Ocean on a 55 day voyage. 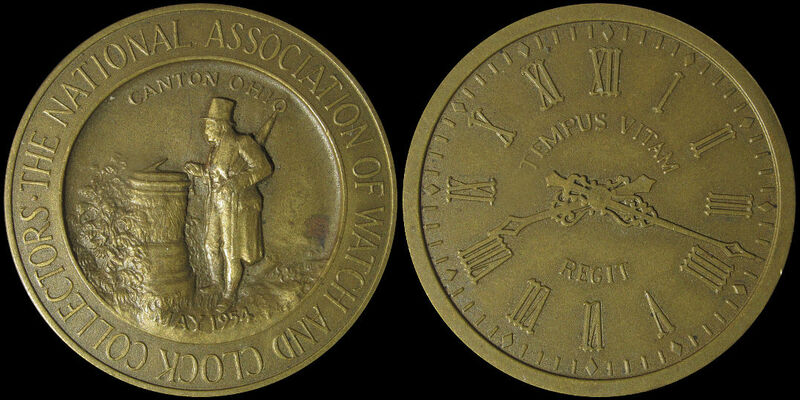 Medal minted by Pinches of England. Read above. Rare bordering on Very Rare. 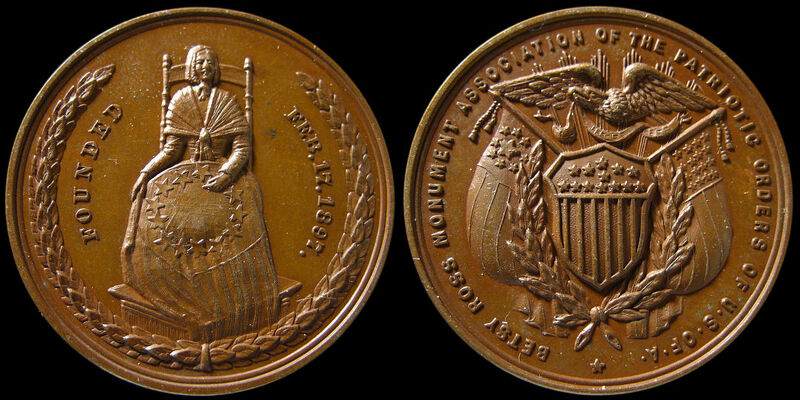 Bronze, 38.2mm. 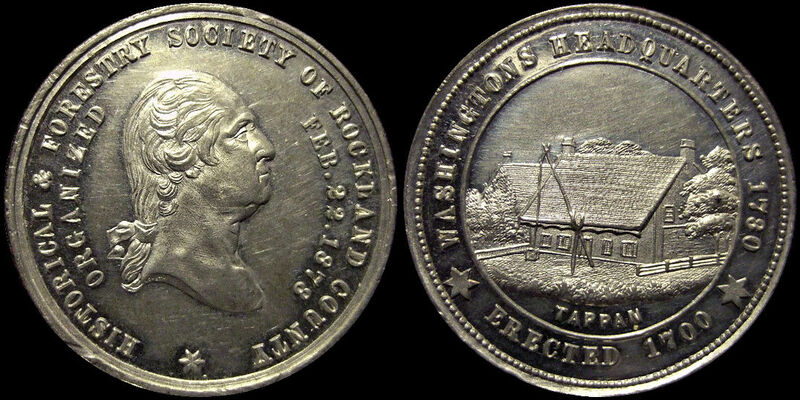 398) "Betsy Ross Monument Association Of The Patriotic Orders Of U S of A". Found in either bronze or white metal with the white metal one possibly being slightly rarer. I have never found one holed in either metal, but have found one in bronze with a clamped on loop. Combining both metal varieties together, Rare. 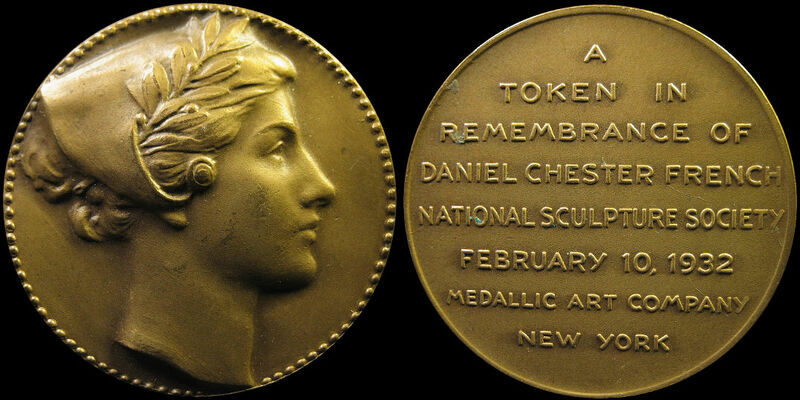 Bronze, 35.2mm. 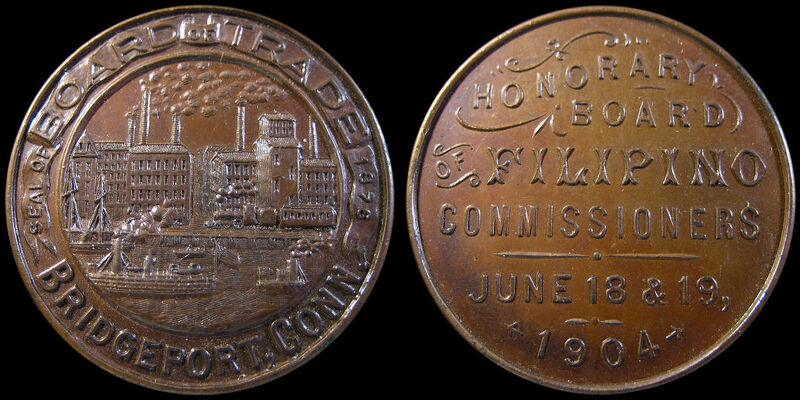 399) "Honorary Board Of Filipino Commissioners.....", "Seal Of Board Of Trade 1876". I guess maybe this commemorates some sort of trade meeting. Any ideas? Also exists in white metal. Very Rare in either metal and often found holed in both metals, sometimes with an attachment. 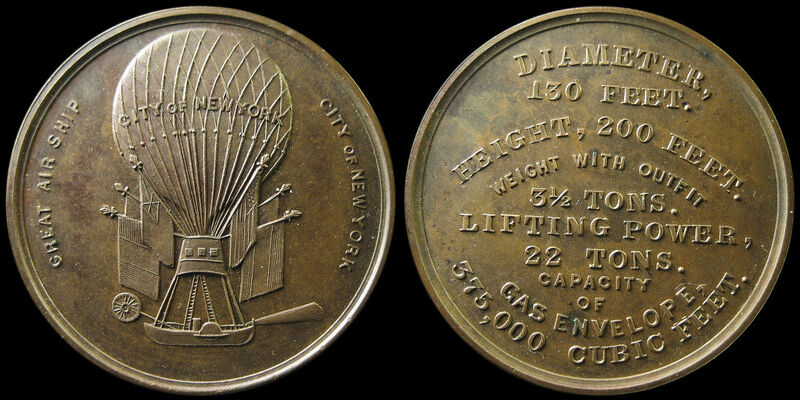 Copper, 38.1mm. 400) This piece celebrates the anniversary of a trade association in the form of a banquet. 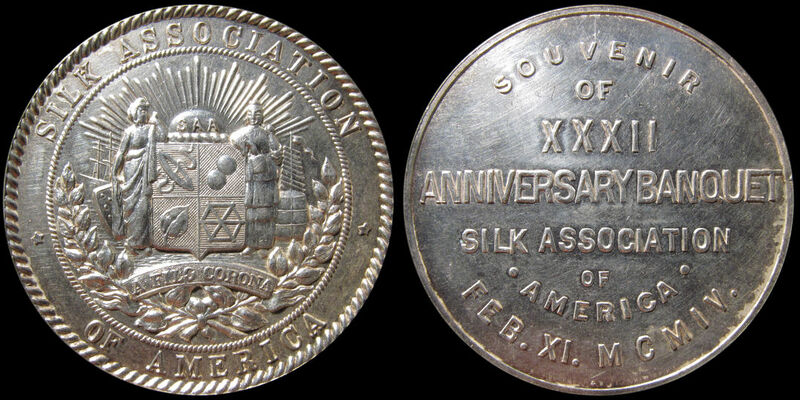 "Souvenir Of XXXII Anniversary Banquet Silk Association Of America Feb. XI. MCMIV". Very Rare. Silver, 38mm. 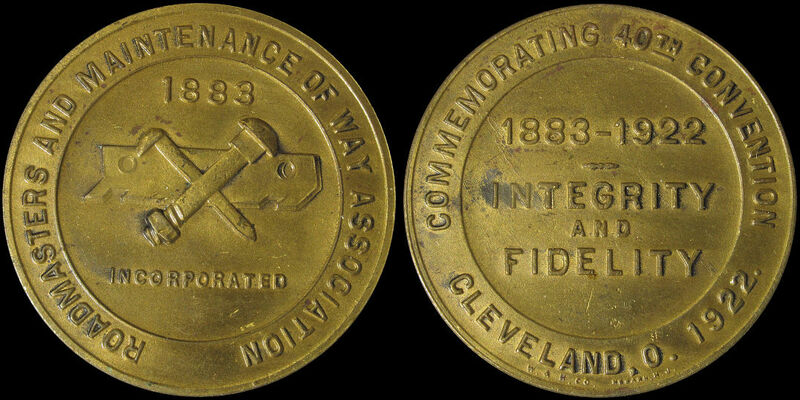 401c) Medal by George Lovett. Found in bronze, white metal and silver. 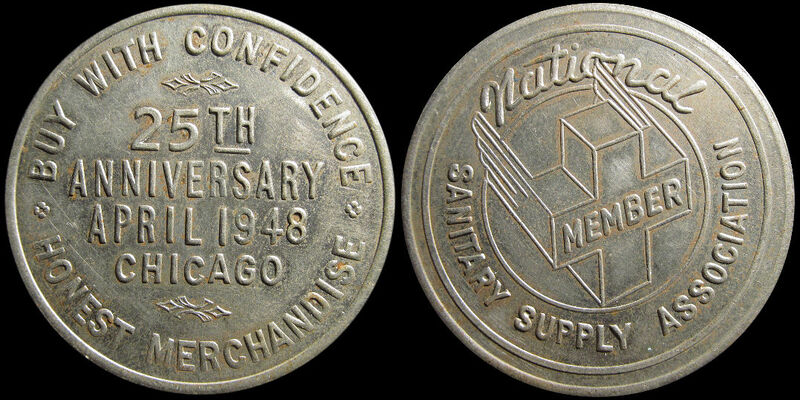 Very Rare in bronze and white metal. 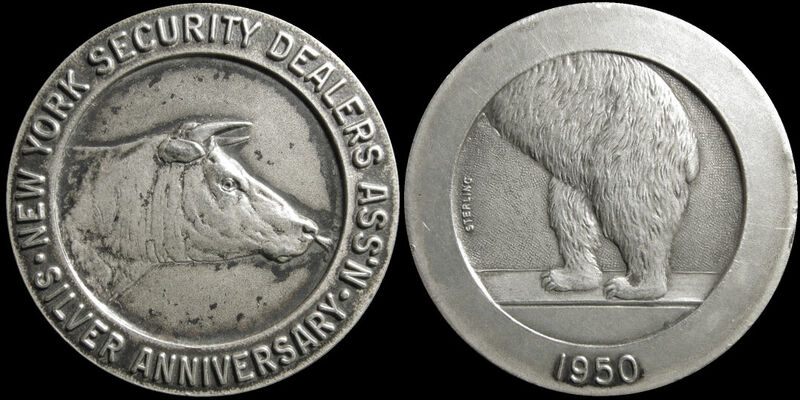 Extremely Rare in silver. 34mm. 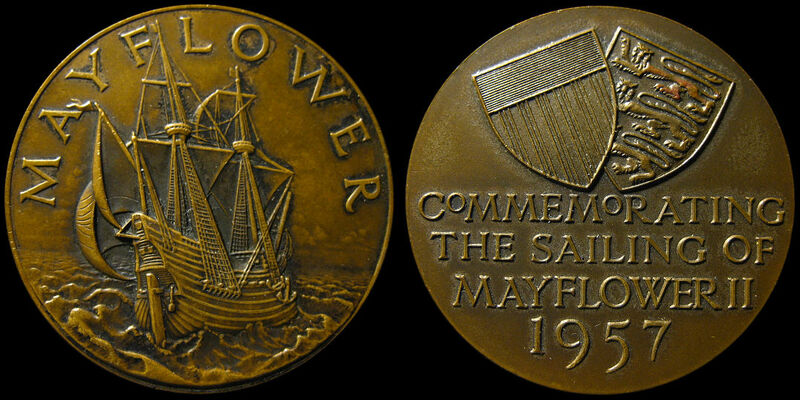 Image courtesy of Dave Baldwin at Lovett Tokens and Medals. 403) Unlisted in the first edition of HK, HK724a in the second edition. 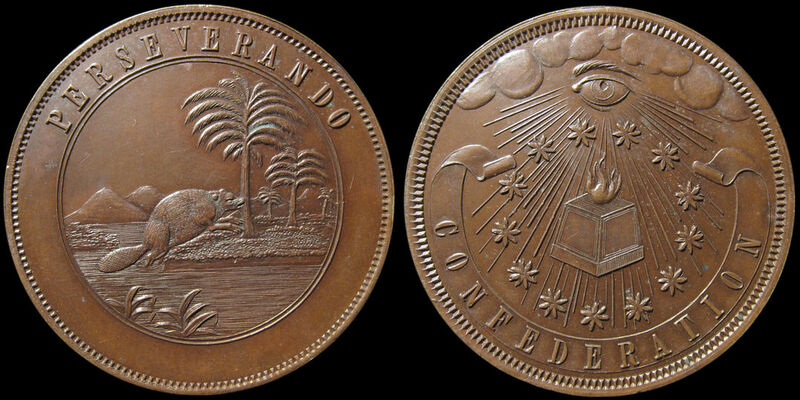 Same as HK724 but with a different obverse inscription. "In Commemoration Of Your Visit With The Mayor". In tiny lettering: "Mfg. By Harvey Aluminum". This piece appears to be rarer than HK724. Rare bordering on Very Rare. Gold anodized aluminum, 37.5mm. 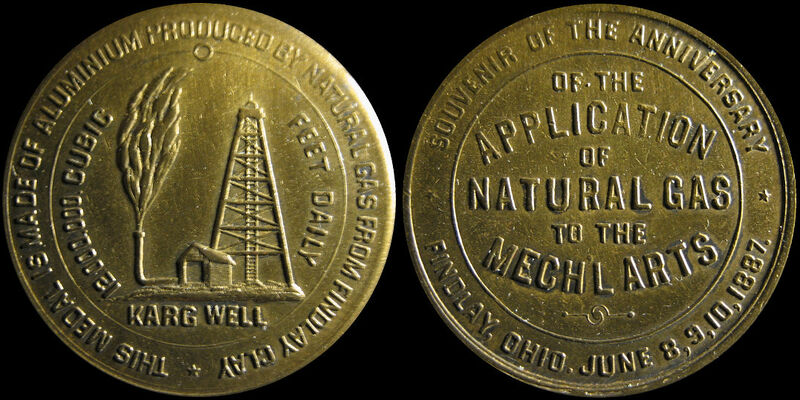 404) "This Medal Is made Of Aluminum Produced By Natural Gas From Findlay Clay / 12,000,000 Cubic Feet Daily / Karg Well"; "Souvenir Of The Anniversary Of The Application Of Natural Gas To The Mechanical Arts Findlay, Ohio. June 8, 9, 10, 1887." 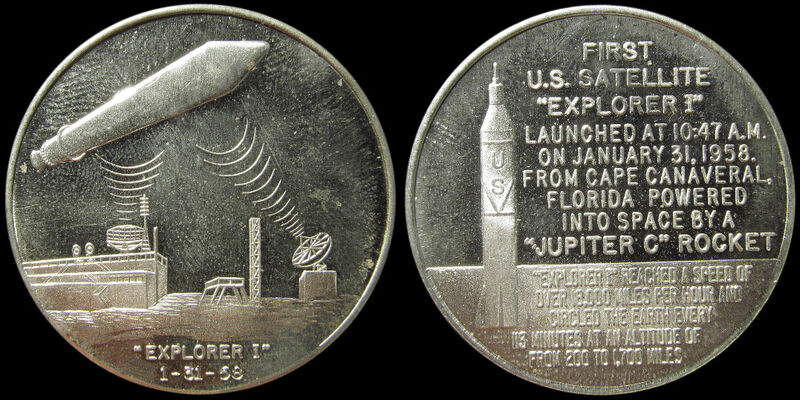 This is a strange medal, as it is never found in aluminum. Rare. Brass, 34mm. 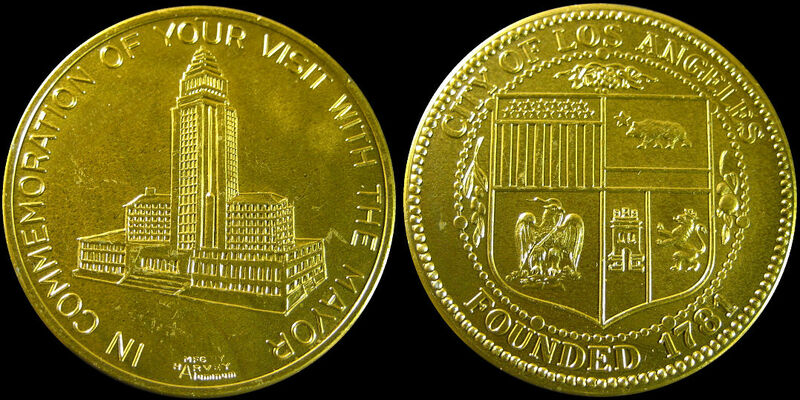 406) An undated souvenir medal from the Puget Sound area around Seattle. The Mt Rainier height of 14,529 was a measurement taken by Edgar McClure in 1897. He was killed while descending the mountain. There were a number of published heights given for Mt Rainier up until 1914 when the US Geological Survey's more accurate measurement of 14,408 was determined. 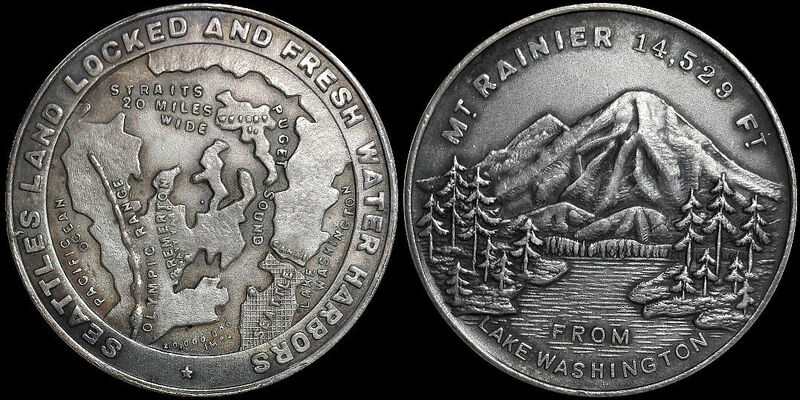 The map side of this piece is similar in style to #81, and like #81 is also found silver plated, but a different size. The piece shown here is solid silver. Very Rare. Silver. 38mm. Also, look at #341b for another piece that is probably from the same time period. Image courtesy of Dan West. 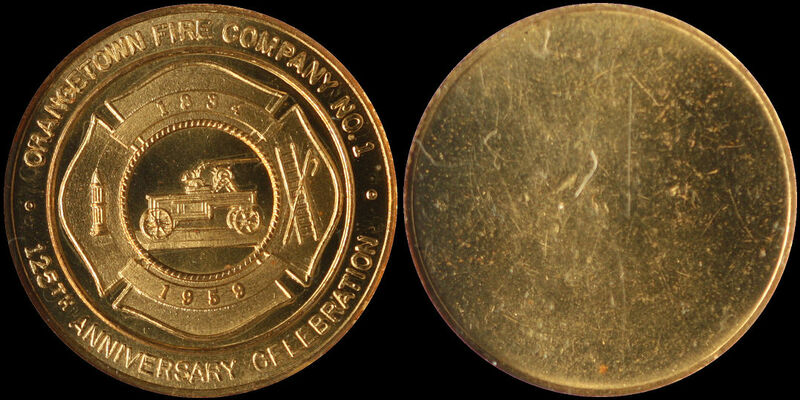 407) Commemorating the 125th Anniversary of the Orangetown Fire Company with a blank reverse. Established in 1834, evidently the oldest fire company in Rockland County, New York. 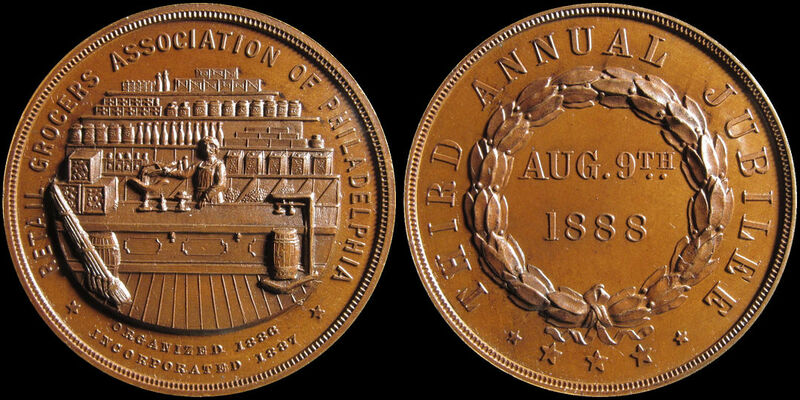 This obverse may have been used with a 50 cent reverse. Extremely Rare. Brass, 34mm. From the collection of Randy Dobler.